The former Stadhuys (City Hall) is today’s Fatahillah Museum. 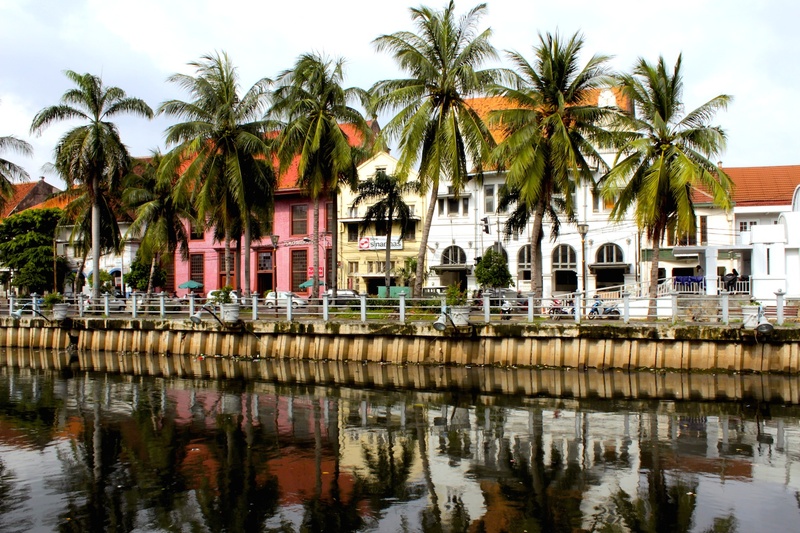 ✑ A walk around the Old Town, Kota, and along the banks of the Kali Besar where the oldest Dutch-era merchant houses slumber in a kind of purgatory. ✑ Take in the monuments around Fatahillah Square. Visit the Jakarta History Museum (the ancien Stadhuys) for the building and the Wayang Museum for the tomb of Jan Pieterszoon Coen. 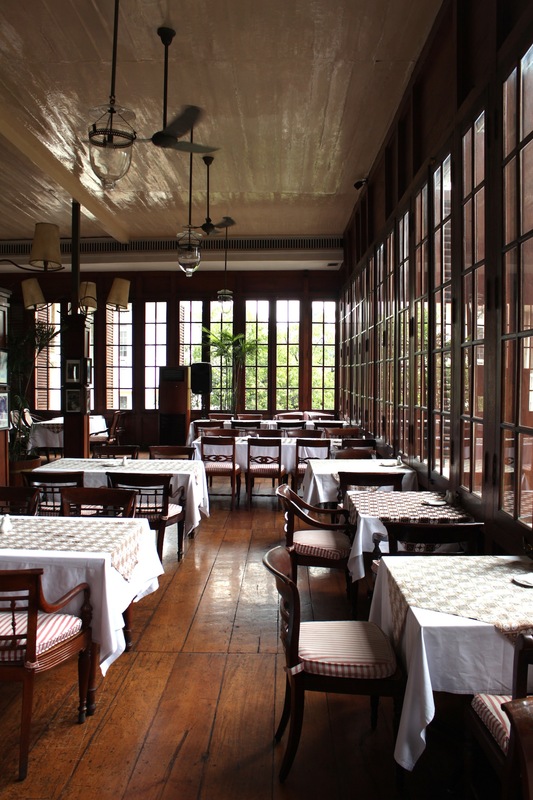 Lunch at Café Batavia – an institution in its own right. ✑ Stop by the Mandiri Bank Museum, for an eerie experience of life stopped in media res; and the Bank of Indonesia Museum for the few precious photos of Indische families that it presents. In both cases, check out the stained glass. ✑ Pay a visit to the National Museum of Indonesia at Merdeka Square, for a mind-boggling display of ancient sculpture from Java’s Hindu and Buddhist era. 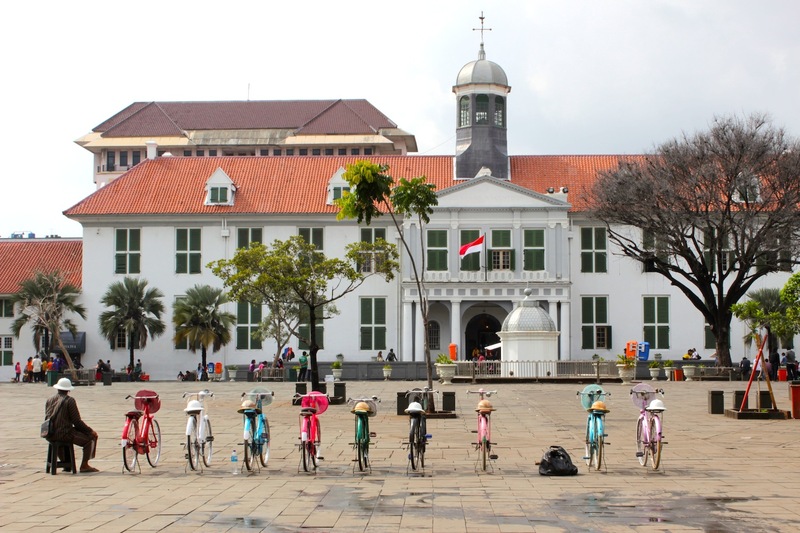 ✑ Take a short detour to the residential district of Menteng, for a glimpse of wealth, privilege and beautiful Indische-style colonial villas. Lunch at the excellent Bungarampai, serving Dutch-Peranakan food. Jakarta has an excellent and totally brand new Bus Rapid Transit system that plies the main streets of the city. It is the only way to beat the traffic, and it is highly recommended if you want to get anywhere. Prepare to brave the crowds. Former bank buildings along the Kali Besar. The former Chartered Bank of Australia, China and India, along Jalan Bank. Cafe Batavia, on Fatahillah Square. Stained glass in bank building. 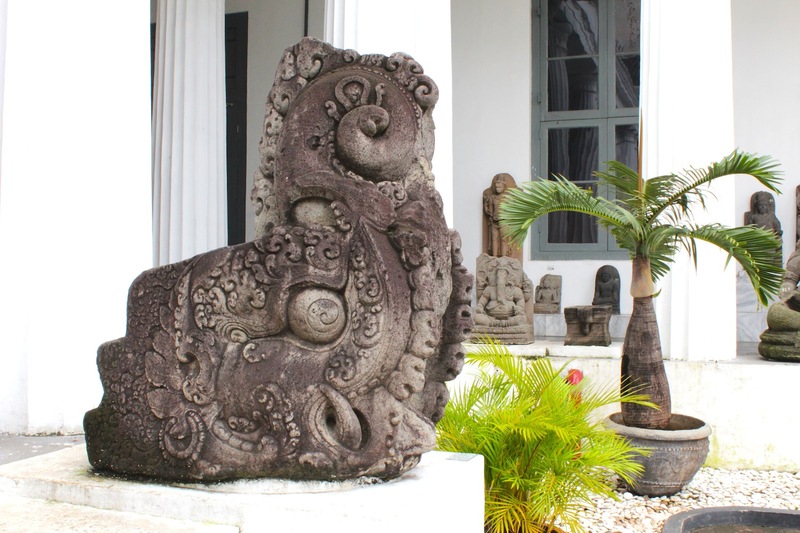 Makara at the National Museum of Indonesia. 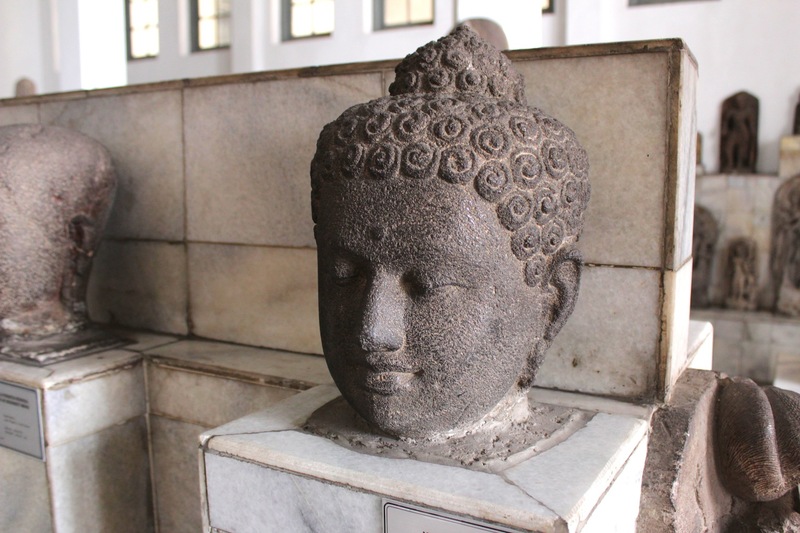 Borobudur Buddha head at the National Museum of Indonesia. 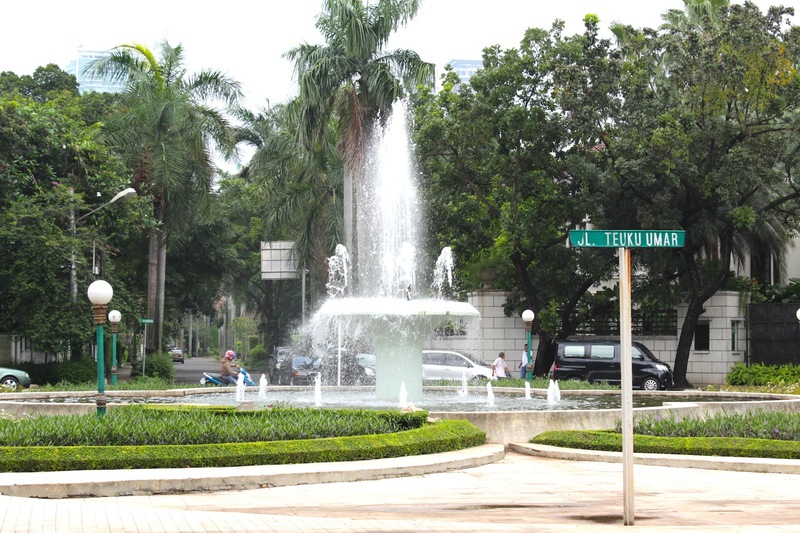 Fountain at Jalan Teuku Umar, Menteng. 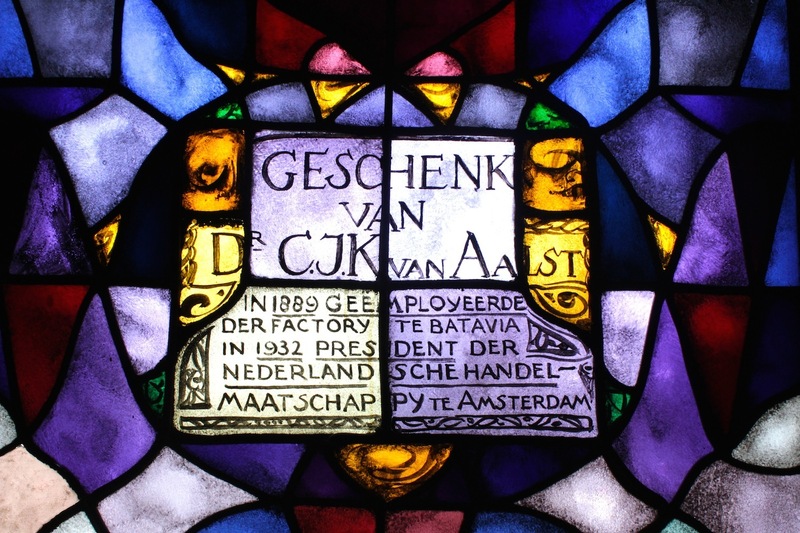 Stained Glass panel at the former De Javasche Bank (1828) in Kota Toea. 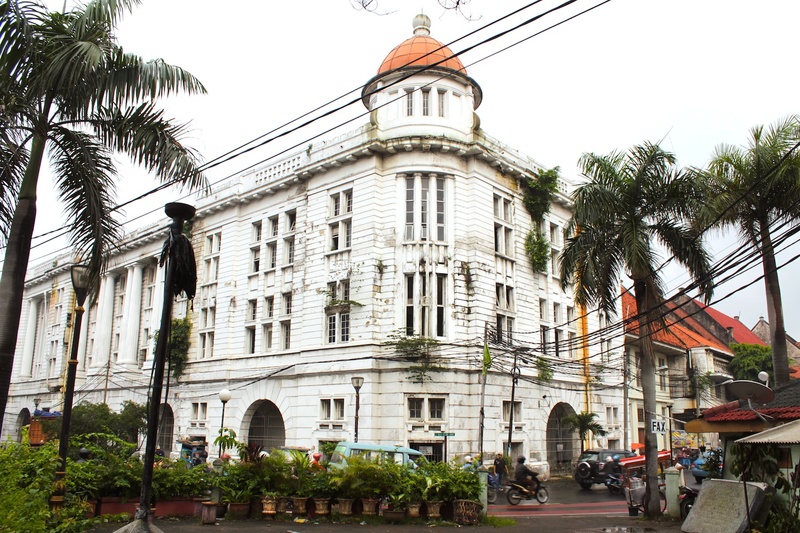 Today, it houses the Museum Bank Indonesia. At the recent book launch on 15 April 2015 at the Singapore Art Museum, I had the chance to highlight some of my favourite images from this Grand Tour project and why I thought they were special. 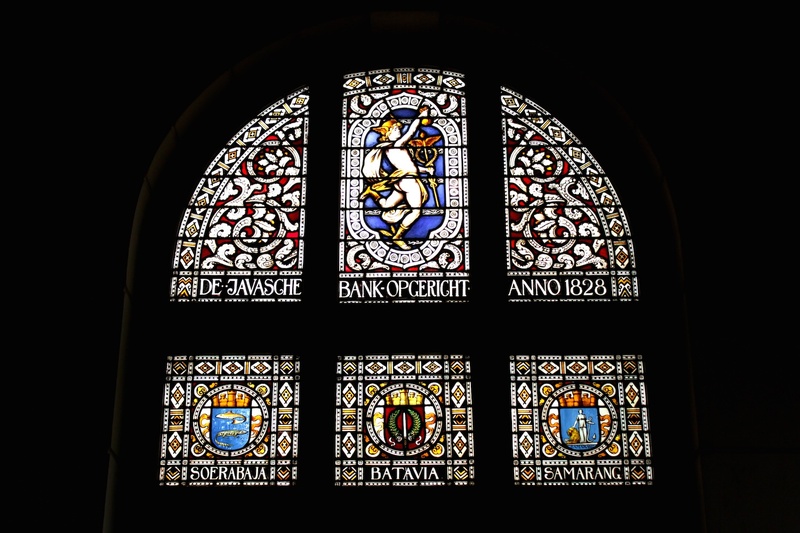 Here’s one of the images – a stained glass window in the former De Javasche Bank (Bank of Java) in Kota Toea – the old town of Jakarta, formerly known as Batavia. The reason why this stained glass window is special is because it spoke eloquently of the guiding philosophy behind Dutch colonialism in Indonesia. Note the image of the Roman God Mercury at the top of the window – this is symbolic for two reasons: the fact that it depicts a pagan god shows how the Dutch considered their new colony a kind of utopia – a new world. At the same time, the fact that they depict a Roman God – and they were very generous with depictions of Roman gods and goddesses elsewhere in the bank and the city – suggests perhaps that they were themselves inheritors of Romans. Or, to put it simply – they were the New Romans, out here in the Far East, creating a new Roman Empire. Stained glass, as we all know, is also a religious form of art. In this case, the fact that stained glass was being used to depict motifs of Empire and Trade – the bottom half of the window presents the coats of arms of Batavia, Soerabaja and Semarang, the three largest port cities of the Dutch East Indies – suggests that TRADE was the new religion. OR, if one were to be a little more cynical, it could also be the Dutch solipsistically referring to themselves as the new GODS, creating a new world out here. Finally, the third reason why this image spoke so movingly to me was because it suggested the existence of a whole different civilisation than ours, that has completely disappeared. It wasn’t so long ago that the Indische, or Dutch Europeans were living here – but today traces of them have been removed so systematically from the city that what remains feel – to me, at least – like relics from a lost civilisation. Chancing upon this image was, in a sense, a kind of urban archaeology.